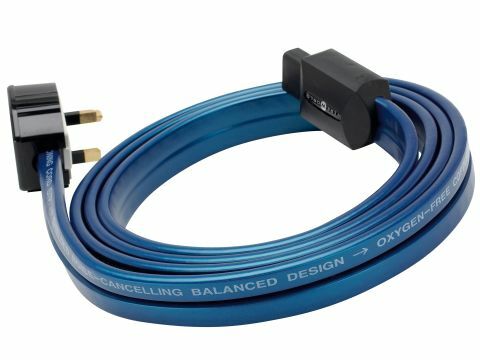 Arriving with a batch of new Wireworld cables, this one caught our attention not least because of its novel shape. With what appears to be two flat conductors side-by-side, it is nearly an inch wide and less than a quarter as thick, and it just fits into the supplied MK mains plug. The IEC connector looks custom-made for this cable. As usual in a mains cable, there is a third conductor (ground), which functions as a screen for both live and neutral cores separately. Each of these is a flat conductor surrounded by a rectangular screen. Wireworld points out that this gives an unusually high capacitance from live/neutral to ground, helping to filter out RF interference. The only drawback we can see is that the cable's a bit of a so-and-so to route, but perhaps 'no pain, no gain' could be applied here. We certainly saw the point when we tested the cable. It doesn't negate the purpose of a full-on mains filter/conditioner unit but it is one of the most effective cables we've tried in terms of lowering the apparent noise of a system and digging out more details.